Yes, I am already in a holiday mood! 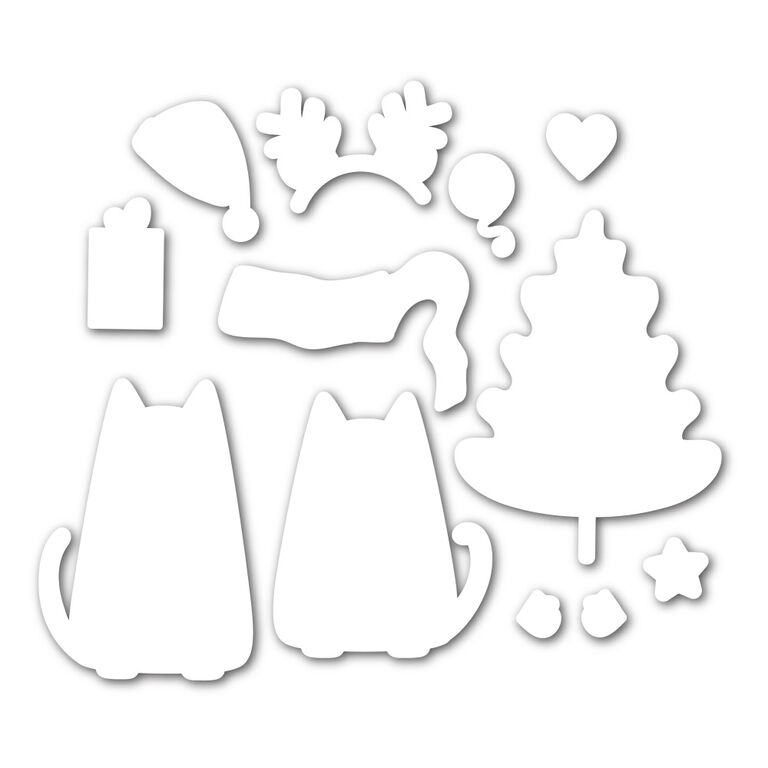 Can’t believe it myself, but all I want to do these days is make beautiful Christmas & New Year cards. Do you feel the same way? I have so many stunning holiday products from last year, I want to play with them before new goodies roll in and I get overwhelmed. 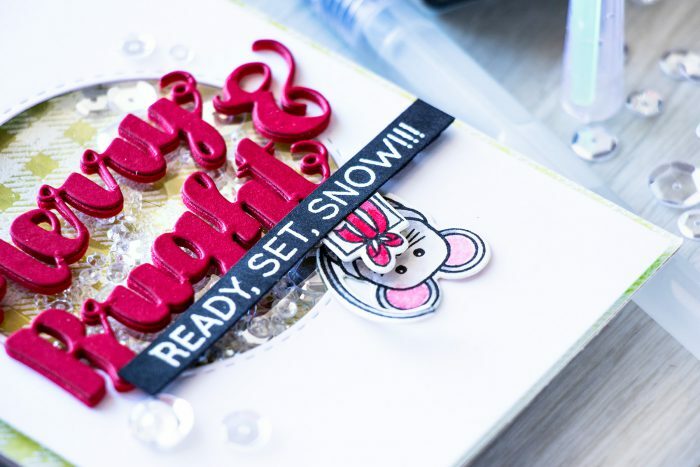 This project is a rather simple to make shaker card that features a little peek-a-boo mouse holding a little present. To create this card I started by making a background – I heat embossed Gingham background in white embossing powder onto a sheet of watercolor paper and did an ombre Distress ink wash in green – started with Forest Moss at the top, Peeled Paint in the middle and Crushed Olive at the bottom. Once my background was dry I adhered it onto an A2 top folding card base. Next I die cut a circle opening in a 4x 5 1/2″ panel made out of white cardstock, added clear acetate for the shaker window, used foam adhesive to create shaker walls and filled the shaker with Pretty Pink Posh Sparkling Clear sequins in various sizes (all linked below). I closed my shaker with another piece of acetate and adhered onto the card base. 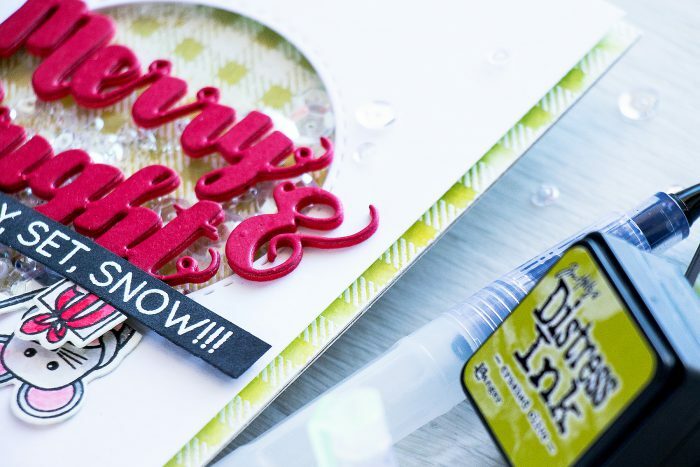 To embellish this card I die cut Merry & Bright twice – first out of Simon’s Schoolhouse Red cardstock and second time out of red fun foam. 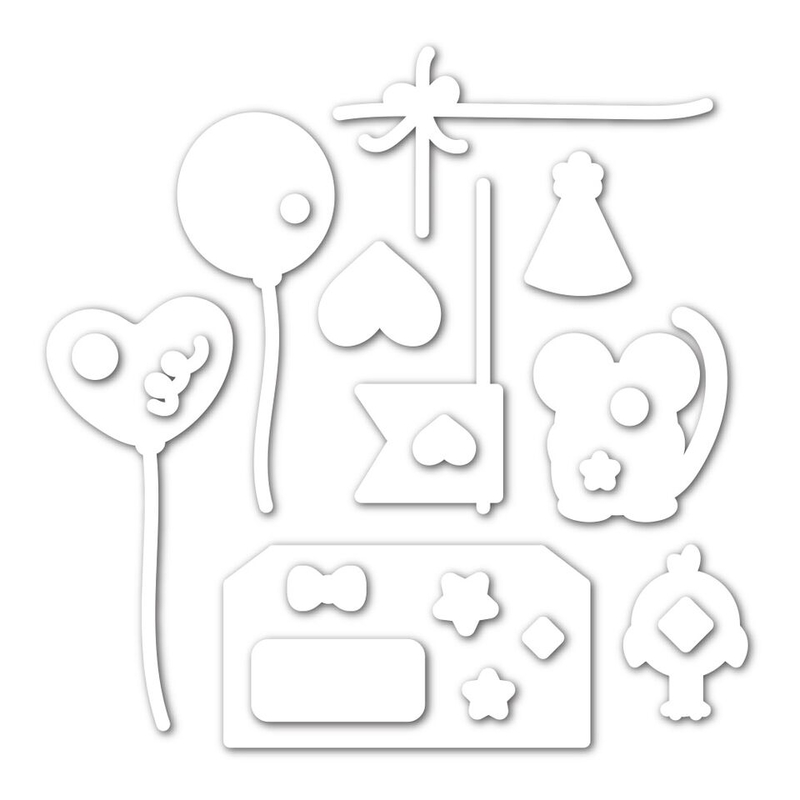 I added Stick It sheets to the back of both paper and foam before die cutting to make sticky die cuts and make it easier for myself to adhere these down. I adhered cardstock die cut onto a foam one to make it dimensional and adhered it onto the card over the shaker area. I wanted to add a little critter to this card so I stamped a little mouse and a gift in VersaFine Onyx Black ink onto watercolor paper, colored with Distress inks and cut out using coordinating dies. 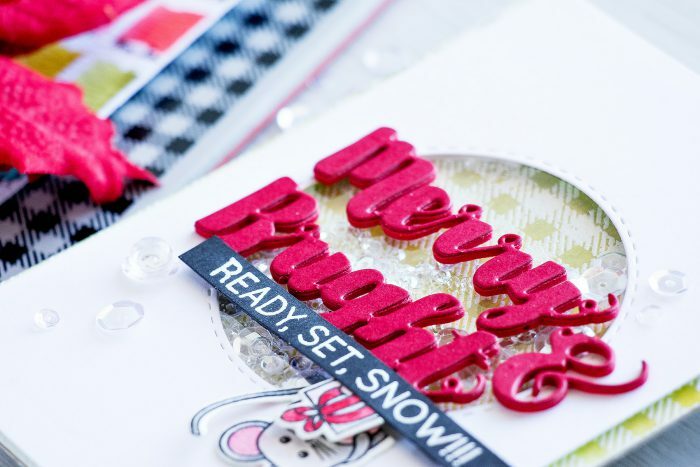 I also heat embossed Ready, Set, Snow in white embossing powder onto a strip of black cardstock and foam mounted it over the bottom part of “Bright”. I trimmed the mouse and a gift slightly and tucked both under the black sentiment strip. Lastly, I decorated this card with sequins and drops. So true about overwhelming. I never have enough time to play with stamps in full before new amazing releases come. And especially with holiday stamps. Your card is amazing! So cheerful and cozy! Such a cute card Yana! I love the ombré background, the color combo is fantastic. The wee little mouse peeking out of the sentiment is adorable. Thanks for sharing and inspiring. This is just so cute Yana. The mouse peeking from under the present is adorable!